Jesus freak Hideout (John DiBiase): How did 4th Avenue Jones start? 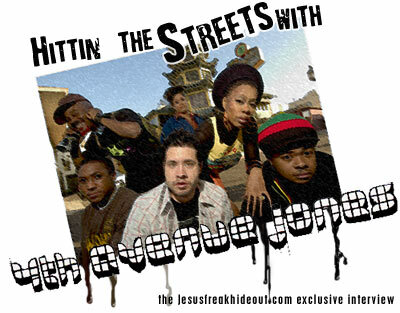 Ahmad Jones: 4th Avenue Jones was a vision that I had. I was a solo artist first and in my mind I knew that I wanted to have a band, because there are endless possibilities when you have live music and talented people come together. It was really about five years ago at GMA... *Ahmad stops because his son is crying continuously and he asks his wife Tena to aid him* I'm sorry... that's my Bubble, and you can quote that! *laughs* (Amy: You call him 'Bubble'?) Yeah! *laughs* OK, well, 4th Ave started really about five years ago at GMA. I got a vision to start a band and God kinda showed me, y'know? And then I started putting the pieces together, recruiting different people and one thing led to another. It was a really organic process. It wasn't like how a label will put the Spice Girls together or something. It was like we found this piece... this worked, this didn't. We're still kinda tinkering around but we're getting close to where we want to be, y'know? JFH (John): What have you been up to since your last release, No Plan B? JFH (Amy DiBiase): Did Interscope record that for you? Ahmad: Yeah, we recorded the whole album there and we put it out independently because we were like, "Yo, people need to hear it!" But Stereo was kind of like what we'd been wanting to do all the time. We just felt reluctant to chase that vision because major labels have a way of making you conform to what they want. A lot of people go in with great intentions, like "No, we're going to keep our true sound..." but I don't know... it's like a plastic factory and they just want to take the life outta you and mold you into some kind of fake thing. We just can't. I'm not having it, y'know? It's all about the art and about just being true, y'know? And I think people recognize when you're being genuine. That's what you look for in an artist is truth. At least, that's what I look for. Do I believe you? And if you don't, then it doesn't matter what it sounds like. JFH (John): How'd you get involved with Gotee? Ahmad: Well Gotee... Jay King knew about our band and was a big fan and he called me up and he's like, "Yo, we want to try to do some stuff. And then we flew out and did a show in Nashville and Joey and all them came and all them from EMI, and they said "Well what do you guys want??" And I said "Well, my own label" and all this stuff that they could never do and they hit me up and were like, "Alright! Let's make it happen!" And we were like "Alright!" As long as we can have our own label, Lookalive. We're actually signed to my own label, Lookalive Records, and then we have a deal with Gotee. So we turn in finished records, we have complete creative control, and then they help us with the marketing and promotion. So it's a good team, y'know? JFH (John): What's the story behind the song "Unhappy Birthday" on your new album Stereo? Ahmad: The band was trippin' because we'd finished the record and then I was like "NO!" Like, I'm telling you, sometimes you'll be at the end and then that just one song, that'll be the best song you make, y'know? And then we did "Overloaded" and "Unhappy Birthday." (Amy: Omigosh! So both of them almost didn't get on!) Yeah! Imagine that album without those, y'know? And I'm tellin' them, "You never stop working, run it all the way to the end of the tape, because you never know what people are gonna gravitate towards." And "Overloaded" was a song that was kind of like we were iffy about cause I'm really singin' on that song. And it's kind of laid back with not a lot of rap and everything and all... There's not any rap. (Amy: I really like it!) Well thank you! And God gave it to me. (Amy: There's an audience that will really like that.) Yup! That's what we were hoping. And "Unhappy Birthday" was just a funky song. We were just like, "We're going to do something really cool." And I was really reluctant to use that title as well cause I thought it was so corny. *Starts singing* "Happy birthday!" Everytime I'd sing it, I was like "Nooo! We can't do it!!" But that's the only thing I could think of, I'm serious. There's nothing else that would come. I remember telling Tim, "I tried to come up with something else, man, and I just couldn't do it!" And I said, "It must be either very good or very bad, but... we'll know soon." (Amy: It's very catchy! And people will be able to sing along to it) *starts singing chorus* Yeah. It's a corny song, but it's really like a deep song if you think about it because we're talking [about how] you cannot enjoy anything in life without love. If you don't have your loved ones or your friends or anyone to share it with, what good is it all? And that's the whole meaning behind that song. JFH (Amy): Did a specific event inspire the song "Sorry?" Ahmad: ...A series of unfortunate events. *Tena lets out a hearty laugh followed by everyone else* I dunno, we get into it sometimes cause everyone wants to make it look like it's all lovely all the time, but we're willing to be like "Yo, we're just young people and sometimes we disagree..." We get into it sometimes and everybody does... You're married, so like, "Oh yeah, you didn't put the top on the toothpaste! I'm tired of you doing that!" Y'know? *laughter* And then I'm gonna ask for forgiveness and you have two choices: either you're gonna forgive me, or not. And we basically leave that song very open to your interpretation of what happened. I don't really define what the offense was because we wanted it to be open ended. Like whatever it may be, you always have two choices. And the better choice, especially if you love someone, is to forgive them and give them another chance. Tena: When you sang that song last night, something popped up and I was [thinking that] it's not just our relationships, it's all kinds of different struggles, because he mentions "I admit I wasn't true," and I don't want people to think he went... y'know what I mean? Ahmad: Well, see that's why I said that, but what does that mean to be not true? JFH (Amy): From where did you hear about the label Gotee or TobyMac? Or did they actually come and seek you out? Ahmad: Well, for me, I think Grits' albums, cause I didn't really like a lot of the Christian hip hop I had heard. And I'm a big hip hop fan even though I don't consider our band a hip hop band. When I listened to Grits, I saw the Gotee tag on there and then I came out for GMA and I saw they have this spot called The Church out here, I was just blown away. They were so cutting edge to me and really kinda pressing the envelope, and I always thought if I ever wanted to partner with somebody, it'd be cool to have a creative bunch of people to work with like that. And then it just kind of came full circle this year, us being here and with them. It's kinda cool, y'know? And TobyMac... just dc Talk, all the way since then. I saw them on MTV I think and that's when I found out about them. JFH (Amy): Where in your lives did each of you either start playing your instrument or writing/singing? Like, at what age did you begin? Angeliqua Gailey "Gailybird" Cowart: Well I started around ten, so I would say ten years. And I started in fourth grade, so the public school system really encouraged me to play and be in orchestra, playing the violin. And I just kept up with it. "Phat" Albert Parker: This is Al, the bass player. I started out on my sixteenth birthday. My father bought a bass for me and I grew up in a musical family. I played in church and some other bands. I was actually at a church and Ahmad saw me playing and then we went to his church. Ahmad: Then I stole him from the church, I'm sorry. ...I'm kiddin. Derrick "Dee" Calloway: My name is Dee. I started playing in church, growing up around church. I actually got my first snare drum in 1999. Then I got my first drum set the Christmas following that. Ever since then, I've just been playing the drums and I found out about 4th Ave actually while I was working at a guitar center. They had an ad posted up on the bulletin and I stole it. *laughter* I'd heard about them a couple of months before that and it just so happened that the church that I was playing at - the pastor there, his kids were ones Ahmad grew up with. Ever since then, y'know, I've just been in the band. Tim Stewart: I've been playing for probably fifteen, sixteen years, something like that? Man, I'm getting old! *laughter* Yeah, I've been playing since I was about thirteen, fourteen. I went to school and studied classical and jazz, playing church all my life. I'm just a music fanatic. In that time, I picked up a guitar... now I wouldn't know what to do without it! Tena: This is Tena Jones. I started singing at about fourteen. What did it for me was... I guess I was a closet singer and didn't know it. A lot of my friends would be like, "Oh I can sing!!" and I'd hear them and they'd sound... kinda bad. So I thought maybe that's how I sounded? En Vogue... I don't know if you ever heard of them. Remember En Vogue? When they came out with that song "Hold On," I wanted to sing just like them. So I went and bought the single and rehearsed and rehearsed and rehearsed it and my Mom caught me singing and threw me in a youth choir and that's my story. I've been singing since like fourteen. JFH (Amy): In what ways does God challenge each one of you with your talents and gifts? Gailybird: Y'know, all my life I've been fighting being a performer. I never wanted to perform the violin. I always wanted to keep it as something I do for fun, I didn't want to work at it. In college, I majored in communications, not music. But, obviously I've been called to do it. So I've been learning to not do things so much my way but doing it the way that God wants me to do it and honoring God and appreciating Him for those gifts so I don't miss opportunities. Al: One time I was trying to remember why I started playing, cause as a musician you go through a couple things that kind of change your perspective about it and about how the business works and stuff like that. So I was really trying to rewind and see why I'm playing and who I'm playing for - as opposed to showing off to people I'm a bass player, y'know what I mean? Dee: For me, it's just trying to figure out my purpose and why I'm playing the drums, too, because when I was younger, my grandmother got me guitar lessons -- pretty much every lesson you could think of, and I never stuck with it. As the years passed, I just grew up in church hanging around drums... I'd always had a love for music, it's just I didn't know that I'd be playing drums and be a part of a band. Another thing I'm challenged with is not taking it for granted because so many things can happen to certain people to where they get in situations where they're losing their vision or they're disabled, and I'm challenged with that pretty much every day. Not forgetting Who gave me my gift and where it came from and just appreciating it and having a love for it. So I just appreciate that. JFH (Amy): One last thing, Ahmad, what was it like working with several maintstream celebrities, specifically Will from Black Eyed Peas, and did any of them propose any opportunities for evangelism? Ahmad: Y'know, I talk too much. *laughs* I'm always sharing my thoughts and ideas with people, especially Will, and I remember one time... me and Will went to Jr. High and High School together. So he's an old friend. He was telling me, "Hey man, I got saved, my grandmother took me to church, y'know, I got the Holy Ghost!" He was so excited! And after awhile, I saw the band eating away at him a little bit and then the next time I saw him, he was like, "Yeah man, I don't know what I believe." And I was just always trying to keep him motivated to know that God loved him and, even as he struggles to figure it out, God's always gonna be right there at the end of the day. The money's not gonna do it, the fame's not gonna do it. So I'm very vocal with whoever. And it's really surprised me because when people came in to rap on the No Plan Be Pt. 2 album, one of them in particular, he had a verse that he was doing and I was like, "Man, that verse won't fit in our song, cause we're Christians..." He came with another verse that was probably like the most Christian verse you could imagine. *laughs* Everybody knows right from wrong, I think sometimes you just have to like kinda push 'em to do the right thing and just set boundaries, like "over here, we're gonna do it this way." And I think people appreciate you, especially when they respect what you do and feel like you're talented and a peer, then they can receive it a little better. So, I talk too much... (Amy: That's great! God uses you wherever you go) Well, praise the Lord!